Reverend Edwin M. McMahon, Ph.D. is a teacher, author, psychotherapist, priest and cofounder of the Institute for BioSpiritual Research who has spent his life researching how parents, child caregivers, teachers and others who interact with children can personally learn to experience an inner process that creates human wholeness. 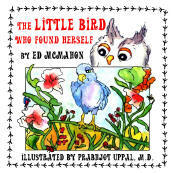 The Little Bird story does this not only because it uses a non-technical, non-abstract story line, but because it neither accuses or blames, nor arouses resistance or fear in the reader/listener. Instead, it moves directly and gently into the body's knowing where it can resonate with truths hidden within, stirring up a more embodied and meaningful connection that touches the reader/listener's life.